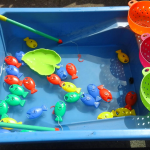 Brocton Pre-School Playgroup provides sessional care for children aged 2 - 4 years old. We are located in Brocton Village Hall which is situated on a quiet lane free from traffic and noise. We are a committee run group and employ 6 members of staff who are all DBS/CRB checked and fully qualified early years practitioners. Your child will benefit from a great keyworker system that will help your child to settle in quickly to Pre-School. Children enjoy quality resources and activities that are linked to the Early Years Foundation Stage Curriculum. Children learn through their play and we enjoy setting up our environment to provide fun and stimulating activities to enhance this learning whilst also helping every child to become independent in readiness for moving on to school. *Registered to receive government funding for Early Education Funding for 3 & 4 year olds plus 2 year old Think 2 funding. Tapestry Learning Journey that enables you to follow your own child's learning journey with us daily, you will receive photographs and observations from your child's first day. A lovely outdoor play area, music and dance sessions, mud kitchens, rhyme time, numerous role play designs, everything to inspire your child's learning and curiosity.